For years now, DC Direct has had no competition. Hasbro was only making animated figures, and for a long time Mattel followed suit. When Mattel did try to make larger, comic-based figures, they were terrible. So terrible, in fact, that we managed to get six installments of a series we called "DC Direct Schools Mattel" out of it. Then Mattel started to fight back. Their Scarecrow was right on par with DC's, and their Doomsday and Supergirl were better than DC's, but that could be attributed to the passage of time. Now, however, all the excuses fall away. Welcome to Part 2 of "Mattel schools DC Direct." 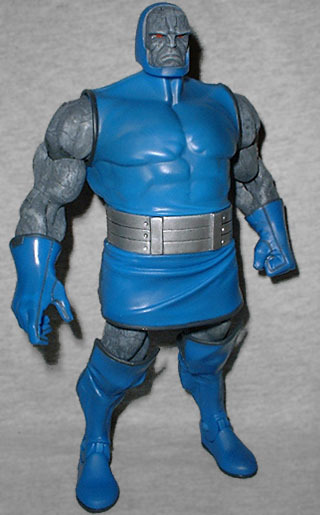 DC Direct just released Jack Kirby's ultimate evil, Darkseid, in Series 2 of their Superman/Batman figures. The figure had its strong points, but also had a lot of flaws, which opened the door for Mattel to show them up. Darkseid was part of the wild new mythology that Kirby created as soon as he jumped ship from Marvel. It's only recently that he's been adopted as a Superman villain (for years, they used the knock-off Mongul to fill that role), which is how he's made it into this line - DC won't grant Mattel the license for anything beyond Superman and Batman right now. But really, their connection is much older: Darkseid originally appeared in an issue of Superman's Pal Jimmy Olsen, incongruous as that might seem. 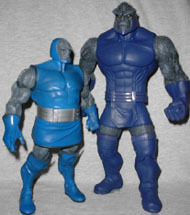 Darkseid stands 7⅞" tall, which is smaller than the DCD version, but still appropriate for the character. It suggests that Mattel has cleared one of thier major hurdles: an unwillingness to make villains bigger than the hero. He's so big, in fact, that he's actually squatting in the package - look in from the side, and you'll see he's got his legs tucked up under him so he'll fit in the blister. 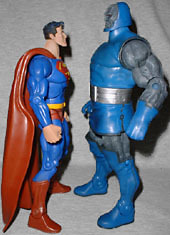 This is made possible by another area in which Mattel's Darkseid is better: articulation. DC Superheroes Darkseid moves at the ankles, knees, thighs, hips, waist, gloves, elbows, biceps, shoulders and neck - that's 18 to DCD's 11. His head, shoulder and hips are balljoints, for maximum poseability. His waist is actually a bit higher than usual, at the top of his big gray belt. The Four Horsemen's sculpt is great. Was there really any doubt? Darkseid is thick all the way around, just like he's drawn in the comics. His face looks dead-on accurate, with an imperious glare that suggests he might fry you at any moment. His skin has the appropriate stony texture, but it doesn't get in the way of the sculpt. He's wearing his classic costume - a one-piece bathing suit with a skullcap and knee-high boots. 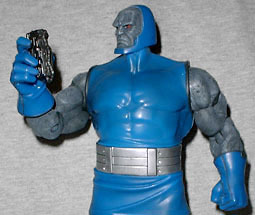 Darkseid has one accessory: a small, handheld computer which is covered with typical Kirby-ish designs. It's most likely a Mother Box, the all-purpose sentient computers that exist in the Fourth World comics. It's just a solid grey piece, but it's designed really well with fancy little tech details all over and he looks great holding it. Mattel made a really... well, I was going to say "odd," but that's not right. They made a really stupid choice with DCSH4. Series 3 came with cardboard backdrops for the characters. Granted, they were all the same backdrop, which was lazy, but it still worked. For Series 4 they've gone back to including reprint comics, like they did for Series 2 - another Superman series. The problem is, they included the same exact reprint comics from Series 2, so Darkseid is packed with a comic that's all about Bizarro. What the hell, Mattel? In the recent Seven Soldiers mega-series, writer Grant Morrison did what no one since Kirby has really been able to do: he made the New Gods interesting. It's revealed, in the four-issue Mr. Miracle mini, that Darkseid has finally discovered the long-sought Anti-Life Equation, and shares it with (ie, uses it against) series star Shilo Norman: And the Anti-Life Equation = loneliness + alienation + fear + despair + self-worth ÷ mockery ÷ condemnation ÷ misunderstanding x guilt x shame x failure x judgment, n=y where y=hope and n=folly love=lies life=death self=dark side. That makes more sense than the idea ever did in the first place, and is pretty grim in the process. Way to go, Grant! And really, way to go, Horsemen. You've proved that even an old dog can learn new tricks, that a company firmly established and stuck in its ways can make smart changes to compete for the collectors' market. Better sculpt, better articulation, better accessories, better price... the only category in which this Darkseid doesn't beat DCD's is size, and even that turned out better than expected. Mattel has done it. They've taken DC Direct to school.